These two handsome and distinctive paperbacks form part of a series showcasing the work of Russian Master Mikhail Bulgakov. Some of the stories in Notes on a Cuff appear in English for the first time, so this is a real treat for Bulgakovians. In addition, both books include valuable textual apparatus: photographs (Mikhail was quite the dandy), notes and a concluding section on the life and work of Bulgakov. Bulgakov’s lifelong financial troubles and his largely fruitless struggle for recognition (few of his works were published in his lifetime, including The Master and Margarita) are extremely chastening for us today, when so much emphasis is placed on achieving one’s goals: in an era when we plan for success as more or less inevitable, failure can only be blamed on the individual. If Bulgakov had compromised more he would have suffered less, but isn’t that also today’s tacit expectation? Bulgakov’s mind was saturated with literature; he views the world through a lens of literary allusions to Dostoevsky, Gogol, Nekrasov, Pushkin and Tolstoy, for instance, from whom he also found inspiration for his own writings. The more one learns of his struggles with Stalin’s censors and secret police, the totalitarian state’s labyrinthine bureaucracy and its insistence on the propaganda function of art, the more one realizes how appropriate – realistic even – was Bulgakov’s instinctive resort to dream and allegory, in what would be called today ‘magic realism’. To use an example from a completely different context, it’s rather like discovering that Sinclair Lewis, far from being a cynical satirist of his own society, was in actual fact its dispassionate observer. Notes on a Cuff and Other Stories contains mostly fragmentary and minor work from the early 1920s: short stories and journalistic sketches written at a time when Bulgakov was trying to establish himself as a writer (he never really succeeded in this endeavour, despite some success with plays written for the theatre). Notes on a Cuff is not therefore a good place to start for readers new to Bulgakov and is more for dedicated disciples. For me, the highlights of the collection are the eponymous story Notes on a Cuff and The Murderer, the latter of which is more conventionally structured than most of the other pieces, but evokes the chaos and moral horror of the Russian civil wars in a way reminiscent of The White Guard, a wonderful novel written two years earlier. It also illustrates one of the key themes of Bulgakov’s oeuvre: an intellectual’s journey from reflection to action when confronted with evil. The story Notes on a Cuff is clearly inspired by Bulgakov’s own journalistic experiences and contains a great scene in which the narrator searches for his office (gone missing overnight) in a maze-like building with obvious allegorical resonances and nightmare associations. One is inevitably reminded of Kafka here, but Kafka’s descriptions are of a modern bureaucracy implacable in its rationality and impersonality, whereas Bulgakov’s world is stuffed with hostility, petty tyrants and irrationalities of all sorts. Prior to this reading, I had only ever read Bulgakov in French translation, which includes Barbara Nasaroff’s version of Le Feu du Khan Tougaï (The Fire of the Khans) and J’ai tué (The Murderer), both of which are translated here by Roger Cockrell. Both translators do a great job of rendering these stories into clear and comprehensible language. On the other hand, the translator’s notes to the stories in Notes on a Cuff are often perfunctory – confusingly so in the case of the first story, Notes on a Cuff. For instance, the note to the heading ‘No Worse than Knut Hamsun’ informs us that Hamsun (1859–1952) was a ‘Norwegian writer’. If it was thought necessary to inform us of this, why not also mention that Hamsun wrote a novel in 1890 entitled Hunger, which would then explain Bulgakov’s joke in the single line of text beneath the heading: ‘I’m starving …’? In this and other instances it would have been useful to learn what kind of writer or poet the person was: the Russian literary scene at this time was a hotbed of different schools and tendencies, so to be told simply that Osip Mandelstam, for example, was ‘a poet’ is hardly informative. Similarly, while much in the way of biography is provided at the end of the book, it might also have been helpful to include a short paragraph of contextualization for each of the pieces, either in the main text or as a preliminary note. The French translation provides this contextualization, so that the stories are not left in a kind of social and aesthetic vacuum. The other volume under review, Diaboliad and Other Stories, again contains minor pieces, apart from the story Diaboliad itself which, along with A Dog’s Heart, conjures the same world as Bulgakov’s masterpiece, The Master and Margarita. However, I’m afraid I had trouble with Hugh Aplin’s translation of Diaboliad, which gives the impression of leaning more to the letter rather than the spirit of the original. Constructions such as ‘With a staccato clattering he ran down [the stairs]’ and ‘Footsteps could be heard coming towards him from below’ not only sound odd and become wearing, but also serve to render the embattled and increasingly desperate Korotkov (the central character) as a somewhat detached and impersonal figure. Compare Françoise Flamant’s renditions of the same sentences: ‘He ran down [the stairs], his heels hammering on every step’; ‘He heard the sound of footsteps coming from below’ (my English translations). 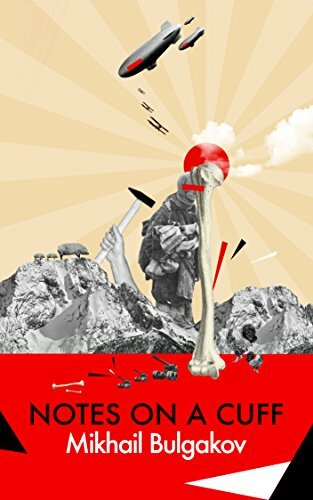 The French version provides the reader with a sense of Korotkov’s agency and intentionality, which encourages our involvement in what is often a tremendously funny story; the English version tends to lock us outside, uninvolved and uncaring. That is a great pity. Confirmed addicts of Mikhail Bulgakov will wish to read these collections for completion’s sake. Others will wish to read the major work first: The White Guard and The Master and Margarita in particular.